And I don’t mean of the artistic variety. I’m talking about the lovely cheese magazine, Culture. Yes, there is a magazine devoted to all things fromage: making, serving, eating, you name it. 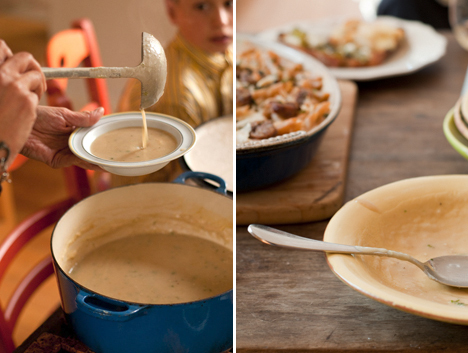 I did a shoot for their winter issue at the home of the Maine-based food writer Kathy Gunst, who prepared several luscious winter dishes featuring cheese for an informal lunch with friends. 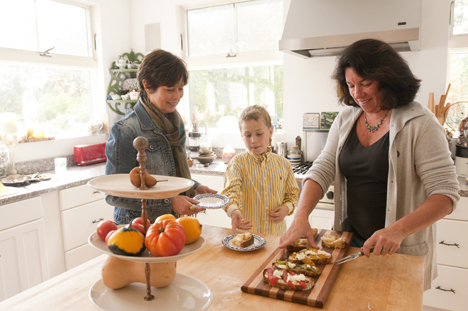 Kathy Gunst serving up open-faced goat cheese sandwiches with marinated peppers. 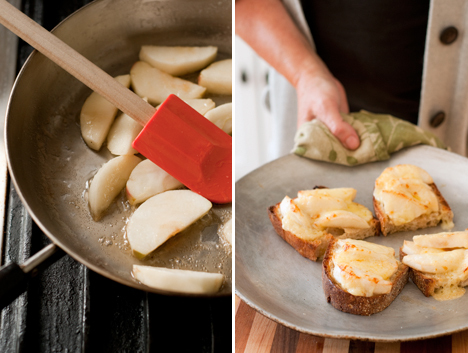 Maple-carmelized apples were an inspired addition to broiled Gruyere sandwiches. First, to be in Kathy’s kitchen was such a treat. Surrounded on three sides by windows that look out over her impressive gardens and secluded woodlands, the kitchen has a huge island in the middle and room for a large dining table and couch as well. It is basically everything you need in one room, which is good seeing as I’m sure Kathy spends a lot of time there! Kathy was an ace at moving things along smoothly. I had to shoot a lot in a short time before the guests arrived, including dish preparation and final, plated dishes. I tend to overshoot, obsessing about every possible angle and composition, but Kathy kept me on schedule. And, of course, I had way more than enough excellent images in the end (the creative director’s words were “It was hard to choose…this could be an entire cookbook! !” Oh well, better than the opposite problem!). Digging into the spread of cheese-centric dishes. 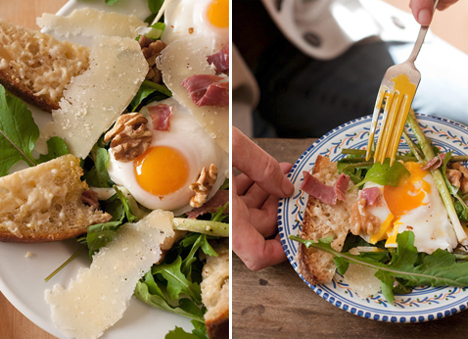 Everything is better with an egg on top. 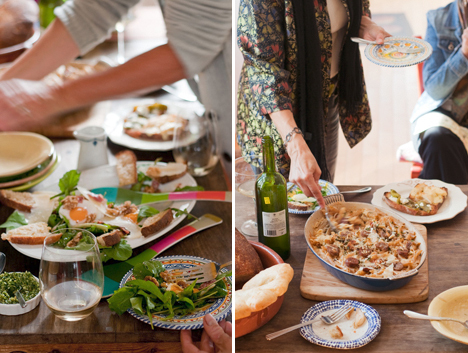 It was refreshing to have an opportunity to shoot a meal in progress, as well. I loved capturing hands reaching for food, forks diving into oozing yellow yolks and soup bowls coated with a residue suggesting recently consumed creamy goodness. And, naturally, I HAD to sample Kathy’s beautiful creations (bistro salad with poached egg and parmesan; leek, potato and cheddar soup; Mediterranean mac and cheese; and two unique types of grilled cheese sandwiches) when I was done shooting. Based on my sampling and the genuine joy that pours forth from her expansive kitchen and heart, I can tell you I would gladly accept an invitation to dine at Kathy’s any day (hint, hint). The next best thing to eating these tasty treats in Kathy’s kitchen, though, is to pick up a copy of the magazine (at Rabelais if you’re in the Portland area) and make them yourself. I just used her idea of making a chive walnut pesto to top off a creamy soup last night, and it was divine. The leek, potato and cheddar soup. This entry was posted in Culture magazine, food and tagged cheese, Culture, Kathy Gunst on December 8, 2010 by Stacey Cramp.